Only your healthcare providers can tell you the exact purpose of your specific prescriptions. However, it’s likely that your medications fall into the categories described in the table below. 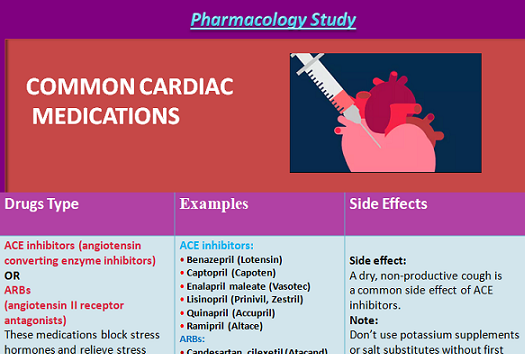 Use this table as a reference to help you learn more about the Cardiac medication you’re taking. These medications block stress hormones and relieve stress on the heart’s pumping action. They improve symptoms and reduce hospitalizations for patients with heart failure. These control irregular heartbeats — and maintain a normal heart rate and rhythm. These cause your blood to take longer to clot, which can reduce the risk of strokes and heart attacks that can occur when blood clots get stuck in small blood vessels. These are commonly used to treat high blood pressure by relaxing and widening blood vessels. restrict the normal flow of calcium into the cells of the heart and blood vessels, which discourages smaller vessels from narrowing and going into spasm, and also reduces the heart’s workload and need for oxygen. These help rid your body of excess fluid and salt. They are often prescribed for high blood pressure and congestive heart failure.